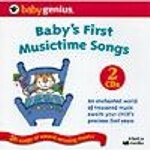 One of our all-time best sellers - This Original Baby Genius release is sure to be one of the best additions to your child's music collection. BABY'S FIRST MUSICTIME SONGS offers timeless, treasured instrumental music for baby's important first years of learning and development. This collection of enchanting nursery rhymes, lullabies and classics will set the tone for a calming and fun-filled day for your little one.